What is Mobile SMS Marketing? Mobile SMS Marketing is one of the most effective, reliable and cost effective ways to market to your clients and businesses. Because SMS is extremely personal, therefore the response ratio is much higher than other marketing channels. In Thailand up to 70 million people using mobile phones. Is your business ready to communicate to this market through Mobile SMS Marketing? 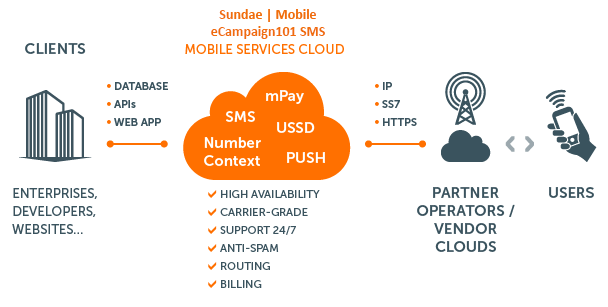 Sundae | Mobile will help you to integrate SMS marketing solutions into your mix in order to maximize your next campaign. It can even help you develop comprehensive database of your consumers throughout Thailand and Global. Mobile SMS marketing and broadcasting are changing the way we communicate in Thailand. Text messaging is now a serious distribution channel that gives you the power to deliver your message directly into the hands of your audience, and create new revenue generating opportunities in the Thailand. Mobile SMS Marketing is an innovative method of promotion and advertising which uses technology of mobile and wireless communication to forward your company’s messages to thousands of targeted customers. Marketing with SMS helps to achieve your promotion goals because the technology associated with this application enables you to set up complex services for ongoing promotion drives. It allows you to get a higher income and provides a customer orientated service that leads to a loyal client base. By connecting to mobile services cloud, any enterprise, financial institution, developer, retailer and marketer can easily reach their customers, regardless of the country and mobile network. Our converged offering of SMS messaging, push notifications and mobile payments helps reach, engage and monetize your mobile user base in 190 countries worldwide. With geo-redundant data-centers, advanced monitoring and highly skilled support verified by thousands of satisfied clients we promise exceptional service delivery worldwide. If you are looking to send business notifications, advertise products or immediately deliver a critical message or alert, there is no better solution available than Infobip’s Bulk SMS. An SMS message is read within 5 minutes by more than 90% of recipients. With nearly 4.5 billion mobile devices used globally, SMS messaging is still the most efficient and personal way to communicate today. Sundae’s messaging platform covers over 800 mobile networks across 190 countries. We offer a set of fully featured web and desktop applications, as well as a powerful collection of APIs allowing for integration from any application. This is all backed by an outstanding 24/7 technical support, available in more than 10 languages. Get a number to send and receive SMS. Virtual long numbers and short codes are the main methods that enable 2-Way SMS. Virtual long numbers are typical mobile numbers provided by mobile operators; they work internationally and when roaming. Short codes are 5-6 digit numbers which are easier to remember and have a national reach. Both virtual long numbers and short codes give enterprises a number they can use to receive and send SMS messages. Why Sundae 2-Way SMS Messaging? Offering an international reach, Sundae guarantees the highest delivery rates on the global market. Our platform is built on a large and growing number of geo-redundant data centres all around the world. The up-time is directly tied to SMSC, so there is no chance of SIM malfunction. Reduce costs by solving number portability issues. People change their numbers, travel out of their home network and change service providers while keeping their original mobile numbers. In situations like this, number validation is of great value. Knowing what numbers are available for sending can substantially reduce the costs of any SMS campaign. Infobip’s Number Context service connects with the relevant mobile numbers home network and can identify whether the subscriber's handset is roaming on another network, currently active or has been disabled. Number validation provides information on what the original network was and which network the subscriber is currently with, efficiently resolving number portability issues. Enterprises, resellers, retailers and other business that need to ensure that campaigns or messages are accurately delivered can rapidly verify mobile numbers and reduce messaging costs. Additional uses for Number Context are to re-verify and “clean-up” existing databases of mobile numbers that are kept by companies. IMSI - International Mobile Subscriber Identity is a unique number burned in SIM card. IMSI is used for authentication, to identify a subscriber to the operator. MSISDN - The actual phone number used for dialing. It is not stored in the SIM card but at the mobile network operator side. This concept allows changing the phone number without changing the SIM card (which contains only IMSI). 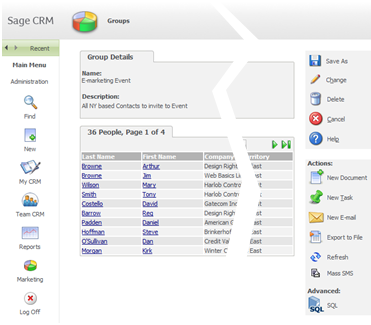 Sundae | SMS provides a powerful and tightly integrated means of sending SMS messages from Sage CRM. Messages are simply scheduled as pending communications and automatically sent to the recipient. SMS paid using subscription from eCampaign101 SMS Service with reasonable cost per message.